Innovation and Ingenuity: The 2018 National Business Club Competitions in Uganda — Educate! | Preparing youth in Africa with the skills to succeed in today’s economy. Last month’s National Student Business Club Competition stunned us, as it does every year, with the brilliant ingenuity and innovation of Educate! Scholars. With 26 Student Business Clubs competing from across Uganda, this year’s competition was an especially exciting weekend full of collaboration, friendly competition, and creative energy. Educate!’s annual National Business Club Competition brings together the top Student Business Clubs from each of Educate!’s community units (district-level groups of 18-22 schools). The Student Business Clubs have prepared for this day all year: With support from their Educate! Mentor and an Educate!-trained teacher, the students launched one or more enterprises, giving them the opportunity to gain hands-on practice starting and running a business in a team setting. In order to reach the National Competition, each Club competed against all the other schools in their district to prove that their enterprise is the most innovative and well-managed. At the competition, the top Clubs from across the country pitch their products to a panel of distinguished judges. After extensive deliberation, the judges give awards in categories such as: innovation, community impact, teamwork, sustainability, and finance and planning. This year, the expert judges brought a wide diversity of experience, with professional backgrounds in entrepreneurship, education, policy, business, and more! Each club participating created impressive and unique products. The resourcefulness, intelligence and dedication these student showed was truly inspiring. The members of the Student Business Club at St. Mary’s Ediofe Girls Secondary School in Arua, West Nile are not only aspiring young entrepreneurs, but passionate advocates for women’s rights and equality in their community. In their club, the students of Ediofe Girls make soy and amaranth porridge flour, shea butter, honey, and peanut butter with the mission of providing nutritious and health-filled food options for their school and community. While the club has earned 400,000UGX (~$107USD) over the past year, profits aren’t enough to satisfy the members of the this club. They are determined to share their skills with other women in their community to help them achieve financial independence. They have observed that many women in their community are negatively affected by domestic violence, forced marriage, and early child-bearing. The young leaders of Ediofe Girls school are committed to changing these conditions, and they believe that helping women achieve financial independence is an important first step. The young inventors of Kitgum High School Student Business Club are dedicated to changing the world one scientific innovation at a time. Hailing from Uganda’s post-conflict Northern Region, these students are passionate about using scientific inventions to improve lives and business opportunities in their rural community. The club showcased a range of creative inventions including: a power source made out of lemons, a solar-powered juice mixer, and a transformer that can be used to charge electronics when there is no power. These inventions were made using local materials and designed to address problems the students have observed in their community. For example, the idea behind their solar-powered juice mixer is to make it easy for vendors to produce juice without using their hands, which can otherwise spread disease. The mixer is made from recycled, locally-available resources and does not require electricity, making it accessible to those living in rural communities. 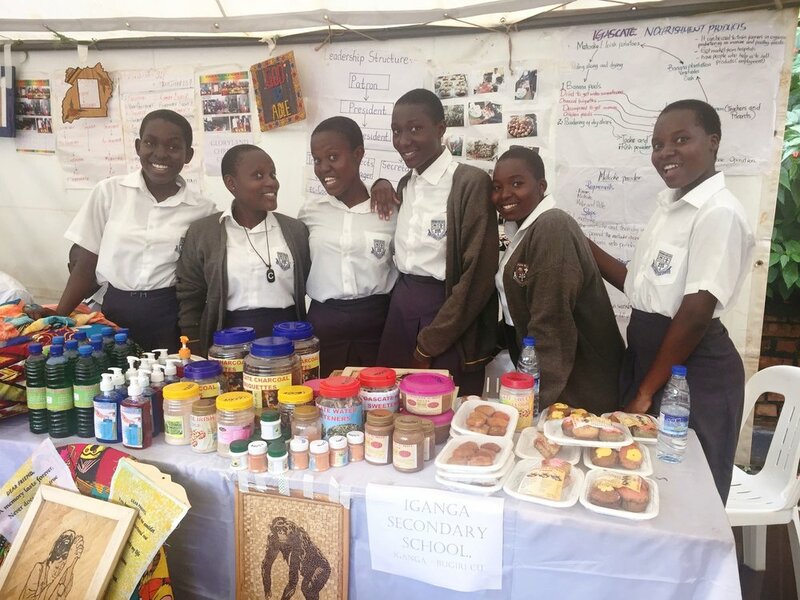 Iganga Secondary School, an all-girls school from Eastern Uganda, won third place in Educate!’s National Student Business Club Competition this year! What excites these students the most (and what made them stand out to the judges) is finding innovative ways to use the readily-available resources around them to earn income and make an impact on their community. Iganga Secondary School Business Club makes a variety of products including recycled charcoal briquettes, artworks out of locally sourced banana leaves, quilts made from discarded fabric scraps, and desserts made from natural, healthy ingredients like sweet potato and cassava. Committed to community impact, the students of Iganga pay it forward by training others in their community. For example, they have trained more than 500 local farmers on how to add value to banana peels by: turning them into manure, crushing them into chicken feed, drying them to create water sweeteners, and burning them to create ash for charcoal briquettes. Educate!’s Student Business Clubs provide an important and practical hands-on platform for students to acquire critical 21st century business and employability skills. These skills will enable them to meet the demands of the labor market or create their own jobs. By the looks of this year's competition, it is clear these students have big plans!